This credit card is issued in the United States. For more information on how to apply for US cards as a Canadian resident, refer to Getting US Credit Cards for Canadians. I wanted to begin writing about some of the US credit cards that I currently hold, and there’s no better card to kick things off than the American Express Business SPG Card, which is offering a truly mouthwatering signup bonus of 35,000 Starpoints until March 28, 2018, in addition to a first-year fee waiver. Until March 28, 2018, you can earn a signup bonus of 35,000 Starpoints upon spending US$7,000 in the first three months. The annual fee of US$95 is waived for the first year. This means that you can obtain 35,000 Starpoints for $0 out-of-pocket, because you can always cancel the card before the second year’s annual fee comes due. That’s an incredible offer, and really demonstrates the massive chasm between signup bonuses in the US and Canada. As a point of comparison, the offer on the Amex SPG Card and the Business SPG Card here in Canada is only 20,000 Starpoints, with a $120 annual fee that’s not waived (although the spending requirement is easier at $1,500 in the first three months). The good news for Canadians is that you can obtain this card (relatively) easily without going through the month-long process of getting an ITIN that I described in my guide on Getting US Credit Cards for Canadians. That’s because as long as you have a Canadian Amex account that’s been open for three months and is in good standing, you can do a Global Transfer to this card! All you’d need is a US mailing address and a US bank account, which you can get set up in a matter of days if you don't already have. Finally, note that the 35,000 Starpoints offer is a promotional one; usually, the card offers 25,000 Starpoints after spending US$5,000 within the first three months. I will say that if you recently obtained this card under the standard offer, you can try your luck calling Amex US and asking to be given an extra 10,000 Starpoints to match this offer, as a “goodwill gesture”. I successfully pulled this off last year, when the same offer came up a few months after I had signed up for the card. On that note, a few important differences exist between American Express’s operations north and south of the border, which are definitely worth touching upon. First of all, American Express has a refer-a-friend program in the US as well, and on this card, you’ll earn 7,500 Starpoints for every referral you make, up to a maximum of 55,000 Starpoints in a calendar year. 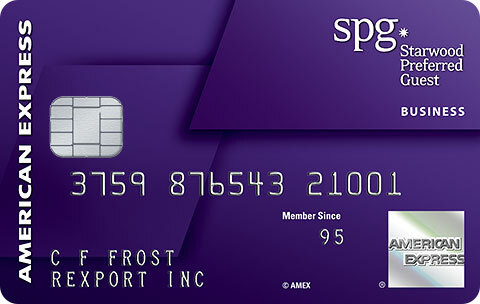 Unlike the Canadian program, though, you can only refer others to the same card – you can’t refer from the Business SPG Card to the Personal SPG Card, as is allowed here in Canada. Now let’s talk about this hefty US$7,000 spending requirement for a second. Remember, never spend more money than you’d normally spend, but instead, there are several ways to creatively meet spending requirements. There’s also been talk that Amex US can see the details of what you purchase at grocery stores, drugstores, etc. so I would avoid purchasing gift cards in bulk whenever possible. There are still a few methods of meeting the spend that I’d consider “safe” for Amex US cards, though these tend to fall into the category of things that are best discussed in private, so shoot me an email if you’re interested. The bottom line is, providing you can meet this spending requirement, 35,000 Starpoints is nothing to scoff at! Also unlike in Canada, American Express in the US strictly enforces their once-in-a-lifetime signup bonus rule. So if you’ve gotten the bonus on the Business SPG Card before, you won’t be eligible this time around. You’ll earn 2 Starpoints per US dollar spent at Starwood and Marriott properties, and 1 Starpoint per US dollar spent on all other purchases. Note that for your purchases made in Canada, using your Canadian-issued Amex SPG Card or Business SPG Card is a better deal than using your US-issued ones, because the weaker Canadian dollar earns you marginally more Starpoints on the same purchase. Like most premium travel cards in the US, though, the US-issued Business SPG Card has no foreign transaction fee, so it’s a good card to use for purchases denominated in foreign currencies. Of course, it’s a great option for any USD spending you might do as well, since most Canadian credit cards would tack on a 2.5% foreign transaction fee. The only thing you’d have to worry about is exchanging currencies when paying off the card, a topic I discuss in detail in my post on Managing US Credit Cards for Canadians. The US-issued Business SPG Card also comes with a unique benefit: access to hotel club lounges at Sheraton hotels, a privilege normally reserved for SPG Platinum Elite members. This benefit is available only at the Sheraton brand, and only on this card – not on the US-issued personal SPG Card, nor any Canadian SPG cards. I used this benefit during my stay at the Sheraton Seattle last year, where I enjoyed breakfast and evening snacks in the Club Lounge. Some Sheraton properties around the world have much more extravagant Club Lounges, where you can enjoy a full buffet spread for all three meals of the day! If you’ve already gotten in the US credit cards game and haven’t held the Amex US Business SPG Card yet, now’s the time to jump onboard. Providing you’re comfortable with high minimum spending requirements, obtaining 35,000 Starpoints at no cost is a tremendous offer, and being able to access Sheraton club lounges is a nice extra perk. If you feel daunted by the prospect of obtaining an ITIN for US credit cards, note that you don’t need one in order to do an Amex Global Transfer to this card. You just need to complete the easy parts of the process, which is getting a mailing address and a bank account set up. There’s one final reason why it’s worth getting this offer, and that’s because no one knows how much longer this card will even exist. It’s been confirmed that Amex will be taking over a portion of the US credit card portfolio of the new Marriott–Starwood rewards program; when that time comes, whether this card is discontinued or transformed into a different product is anyone’s guess. Since Amex bonuses in the US are once-per-lifetime, you might as well make the most of this offer while it’s here! Not too often does the opportunity come around to earn 35,000 Starpoints for free. Since Starpoints are one of the most valuable and flexible points currencies in the game, it’s definitely worth looking into the US Business SPG Card if you’ve got travel plans lined up in the near future, even if it might take a bit more legwork compared to applying for the Canadian cards we’re all familiar with.